By Carl Slaughter: In the 80s, Takamo was a snail mail RPG launched by a couple of college students. In the 90s, it switched to email. Now it’s browser/minion based and operates on the latest platforms. Over the decades, Takamo has evolved into a popular RPG with a massive universe, an ensemble cast of diverse characters, a cross-pollinating, author/developer written encyclopedia, and thousands of simultaneous players. 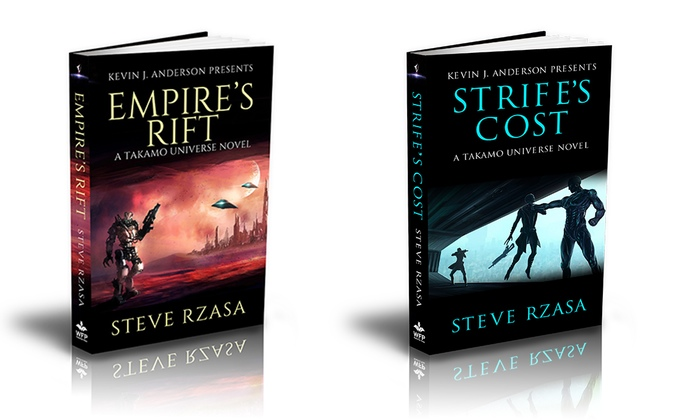 Steve Rzasa has been chosen to write a series of novels sponsored by Kevin J. Anderson Presents. Randall Ritnour is one of the founders and is still at the helm. Look for a Kickstarter campaign in early 2017. CARL SLAUGHTER: How does Takamo work? RANDALL RITNOUR: Takamo Universe is the new game under development. It is a massive multiplayer online game MMO. It is a strategic level sci fi game of exploration, trade, diplomacy and warfare set in our own galaxy, called ESTRA, in the early 46th century. Players control a star system emerging from the ruins of a series of catastrophic wars that have devastated civilization. The game is browser based. Players control planets, fleets of starships, armies, diplomats, and spies. They explore a progressive expanding universe and interact with other player empires in an open ended game where their forces continue to do more and operate, carrying out their orders even when the player is not online. CS: How do the players participate? RR: Players log in to their empire page at any time to review the latest reports, issue new orders to their leaders, armies and fleets, design and build ships installations and other equiment, conduct diplomacy, set up trade routes, conduct research and development, and a score of other activities. CS: How often are the updates? RR: Players receive action alerts by email, smartphone or other device if any new action affects their empire. If they think they need to log on and address the issue, they can do that or if they see that their minions have everything under control, they can go about their day without logging in. CS: What are the operating system and software requirements? RR: Takamo Universe is being developed as a browser based game. Players should be able to access and play the game from most platforms, including smartphones and tablets. CS: Where does Takamo fit into the RPG landscape? How many players? How big a share of the market? RR: The original Takamo is an old play by mail (PBM) game released in 1982. It ended formal commercial production in 1995. It was a massive multiplayer game before the internet existed. We also published Gaming Universal, a small PBM magazine. In 1998, a play by email version was introduced and ran commercially until 2005. The game had about 10,000 players during its commercial run. Back then, there really was no way to measure total market size but we estimated that we held a ten percent share of the market. In 2013, I put together a development team to produce Takamo Universe, a massive multiplayer online game. That project is still under development. It is based on the original Takamo. The backstory for Takamo Universe draws from the history of events in the old game along with stories and illustrations I’ve amassed over the last 35 years. All of this history has been or will be (there’s a lot) loaded into our proprietary Wiki that authors use as a resource when writing for Takamo Universe. STEVE RZASA: Randy contacted me almost two years ago with the offer to write short fiction and “encyclopedia” articles for Takamo Universe. I added several pieces about a half dozen NPC empires, and it was that work which led to my involvement in the first Takamo novel. CS: Takamo started as snail mail 35 years ago. How do you explain its longstanding popularity? RR: Takamo is a strategic level game that encompasses a vast area. It is a game that appeals to almost every type of player. Builders, sneaky smugglers, corporate moguls, pirates, mighty warlords and killer cybernetics all have a place at the table. And the game just keeps going on. You can build, explore, make alliances, and fight wars as long as your empire exists and you want to play. CS: How has it evolved over the years? RR: The most interesting evolution in Takamo has been the history that has developed as player empires clashed and struggled for supremacy in various regions of the galaxies. They wrote their own histories and empire descriptions and published them in our periodical newsletter Threshold and in their own fan fiction pieces. CS: How much does it cost to play? RR: The current Takamo game is free but it is an “invitation only” game being used as a test bed for development of applications for the new game Takamo Universe. Most of the players are Takamo veterans that we’ve managed to track down and invite to the fray. Costs for playing Takamo Universe have not been determined yet but I hate paying big money for games so it will be affordable. CS: Any merchendice? Ship models, action figures, posters, t-shirts? RR: We have a series of blueprints in production and will actually have a few on display at the Book Release Party on November 12th at the Hard Rock Cafe in Denver. STEVE RZASA: I’ve been adding sketches of vehicles from both Empire’s Rift and its sequel, Strife’s Cost, to Takamo for use as fully rendered blueprints. CS: Conventions, fan clubs, fan fiction, magazine? RR: We have a number of authors writing content for Takamo Universe and there are some short stories and novellas that are planned for release late this year as ebooks. I believe the first is an anthology titled For God and Mars which is slated for release as an ebook by the end of the year. CS: Will the plots and characters for the novels come out of the game or be original or a mix? RR: They will be a mix. There are over 4,000 years of history laid out year by year in the Takamo Universe Wiki. Only authors and content developers have access to it. Writers are able to develop their own plot lines and characters or they can draw from characters, items and events in the Wiki. The only restriction is that authors cannot use characters developed by another writer without their consent. The writing effort is collaborative. The characters and plots that authors develop are folded into the Wiki and become part of Takamo Universe canon. STEVE RZASA: Having an authorized canon shared among the fictional universe creators is a great tool for a Takamo author. It helps us all stay on the same page and also provides the seed for new stories. For example, a small entry referencing a skilled thief gave me one of the plot points for Strife’s Cost. CS: Who are the characters and what are their roles in the Takamo universe? STEVE RZASA: Taggart “Tag” Wester is a brash starfighter pilot and son of the Baedecker Four governor. He’d rather be joyriding in his warplane, but the Naplian invasion forces him to put aside his childish ways and assume responsibility he’s never had to shoulder. There’s also Elden Selva, the last heir to Terran rebels who fought two wars trying to gain independence. Their loss means he’s concealing the true nature of his visit to Baedecker – the recovery and reactivation of Truppen cybernetic warriors thought long destroyed. The invasion forces him to chose sides in a conflict he never saw coming, and his life is immeasurably changed. CS: How many books will there be, what are the release dates, and how much will they cost? RR: The plan is for an ongoing series with books published at least yearly. Empire’s Rift, by Steve Rzasa, was released on October 28th. The first draft of the sequel, Strife’s Cost, is finished and is under review now. If the Kickstarter stretch goal is reached, then the book should be released in the first half of 2017. The third book in the series is on the drawing board. CS: Any comic books or TV shows in the works? RR: We have a Takamo Universe graphic novel based on some of the events in Empire’s Rift that is in production. No Publication date set yet. CS: Anything else we need to know about Takamo? RR: We will launch a Kickstarter campaign for the new game Takamo Universe in early in 2017.